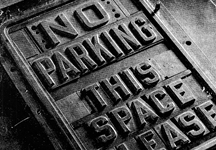 We have the largest inventory of parking signs online and most of our signs are available for 1 day shipping. 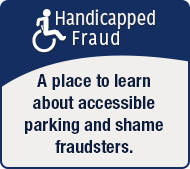 If you don’t find the right message, you can always create your own custom parking signs too. • Most signs ship today or tomorrow. • Personalized signs get results. Stock designs too. • Lasts 10+ yrs outside. Authorized 3M. • Official DOT signs – same sold to cities. • Find just official design for your state. • Elegant designs for upscale properties. • Show that you take care of visitors! • Organize and keep your lot safe. • Proven way to stop illegal parking. • Keep lanes clear for emergencies. • Use again and again. Mark each spot. • Free shipping, which saves $10/post! • Can't miss these. 4' tall! Stock or custom. • Doesn't crack or fade! • Do not block. Stay off of our private road. • Signs you won’t forget! Great for gifts, too. • Your logo at no charge. Durable for 10+ years. • Protect your property. You can’t ignore these! • Cast iron, water-filled, wheelies and more! 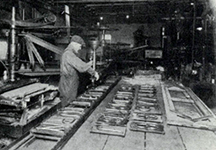 For over 100 years, generations of buyers specified and ordered our products. In fact, some of the very first parking signs in the US were made at our factory, and we’re still family owned and operated. Since then, we have grown to become the largest manufacturer and distributor of parking signs in the US. While many others use lower cost materials and inks, we use the strict 3M Matched Component System as well as a clear 3M approved laminate. 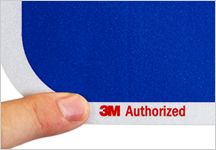 3M Authorized means superior life – and signs that outlast graffiti and UV attack. Signs comply with the DOT MUTCD standards that now require reflectivity for parking signs in lots that are accessible to the public.